First of all, that title was a tough one for me to type — I mean, in my head, I’m still 25 years old, so how could that possibly be the case??? I have truly been unbelievably fortunate to work with some incredible kids – and many have been absolutely, positively, incredibly talented, athletically-speaking. I’ve also had the chance to work with some awesome coaches – whom I’ve learned an awful lot from – starting with Steve Snider, my former cross country and track and field coach. I started coaching Track and Field at Greensburg Salem in 1992 – and contrary to my own background with the sport as a long distance runner – I was hired as a Pole Vault coach. Keep in mind, this was long before the internet and youtube – and my experience with Pole Vault was limited to one approach in junior high in which I dropped the pole, ran up over the pit and kept on running. Pole Vaulters are crazy! I knew nothing about the event – I did my best to research the event, went to a coach’s clinic at Baldwin and then sidled up to Erie McDowell’s Joe Sanford at every meet we went to, attempting to soak in as much as I possibly could in the process. I coached the Vault for 2-3 years until I became our middle school’s Head Coach. I’ll admit this freely – I wasn’t disappointed to move on from the Vault. But one thing I did miss was the camaraderie at the Pole Vault. The coaches all got along. The Vaulters always seemed to get along and pulled for each other. It never really seemed to be cutthroat like so much of sports can be. It was actually a lot of fun and parts of me missed it. We worked together through ups and downs (literally – I know, that was bad), great days and rough ones, triumphs and injuries. I’m not sure that I can describe the anguish tied in to watching one of your athletes being upside down at 13 feet, coming down short, head first toward a steel box. And I’ve seen that plenty. It truly takes your breath away and reminds you just how dangerous the event can be. And I’ve never seen anyone get as inverted as Cassidy can. It’s cover-of-a-magazine worthy. I’ve had the chance to see both of these young ladies compete against some incredible vaulters: Larissa Debich (Auburn University), Kasey Kemp (Penn State University), Lexi Masterson (Penn State University), Brooke Mancuso (Westminster College), etc. – all young ladies who are competing at the collegiate level. Within that list of athletes are WPIAL and State Champions. 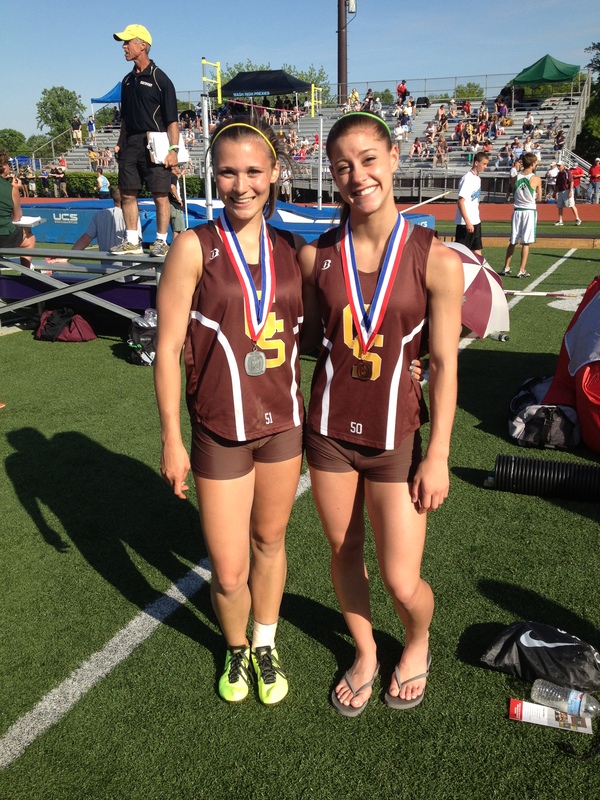 In addition, it’s been great for them to compete against Bridget Guy (Hempfield) and Kelsey Plecenik (Norwin, and a WPIAL Champion in her own right) — two young ladies who, along with Courtney, are pushing themselves to new heights. Keep in mind that with the exception of Brooke, all of the young ladies I’ve listed above went to or go to either Hempfield or Norwin. For those of you who don’t know the area, Greensburg Salem, Hempfield, and Norwin are located within about a 20 mile radius of each other. If you go back to last year’s State Meet, you’ll see that these three schools had 5 of the first 9 places. Let that sink in. And this is just flat out awesome. So let’s go back to what I said before — the camaraderie amongst these ladies is just awesome. It’s amazing to go to meets and see them not only compete against each other, but also pull for one another at the same time. Make no mistake about it — they all want to beat each other. At the same time, though, they’ve all pushed each other to get better in an incredible way. They get along well and it’s just incredible to see them pull for each other as they compete. Along the way, I’ve also learned from some unbelieveable coaches. Beyond Coach Sanford, I’ve also had the chance to work with – and learn from – Craig Stamford and Matt Fox and Melissa White and Jackie Rodgers and Steve Cochran and Jeff Wirth (whom I mistakenly forgot to include on this list) and Rob Theissen and many, many more. To see everyone pull together at a meet is something special. I can assure you that these coaches have made me much better in the process — and I’m indebted to each of them. And this brings me to yesterday at the Pennsylvania State Indoor Track and Field Championships. Going in to the meet, Courtney was seeded 4th, behind Bridget Guy and two other young ladies from the eastern part of the state. If you know ANYTHING about the Pole Vault, then you know that the event is a ton of fun to watch, but you also know that there are a TON of things that can go wrong. Yesterday, just about everything went right for Courtney. She was clean through 12’6″, meaning that she had no misses. 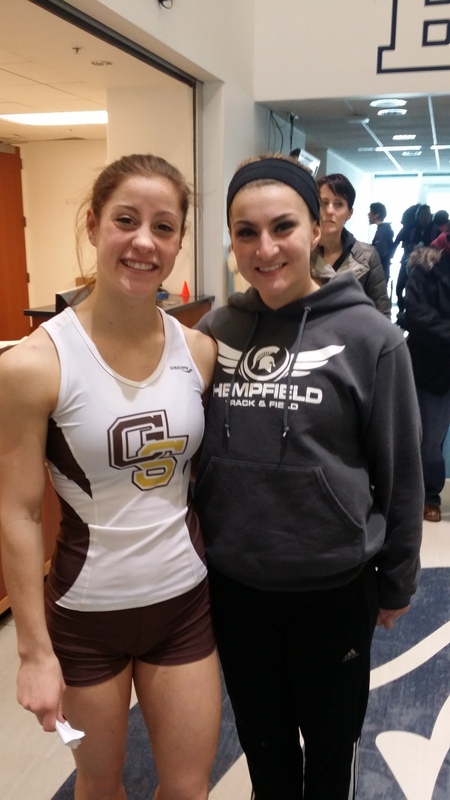 And because she had no misses until 12’6″, she emerged as the 2014 Indoor State Champion in the Pole Vault. It was just an awesome feeling to know that this kid who has worked incredibly hard would get to see that hard work paying off. That’s the ultimate reward as a coach – to see that an athlete gets to see this payback for all of the hard work – and I can assure you, having been there for many of those hours, she’s worked incredibly hard. 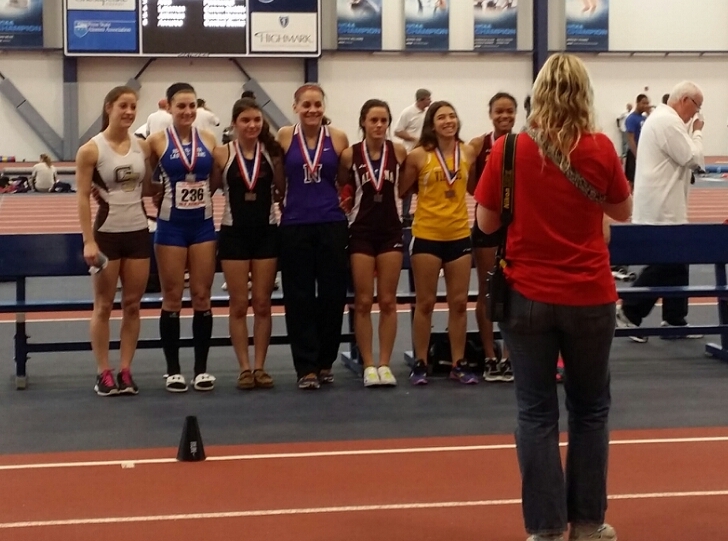 Place winners in the 2014 PA State Indoor Championships Pole Vault. 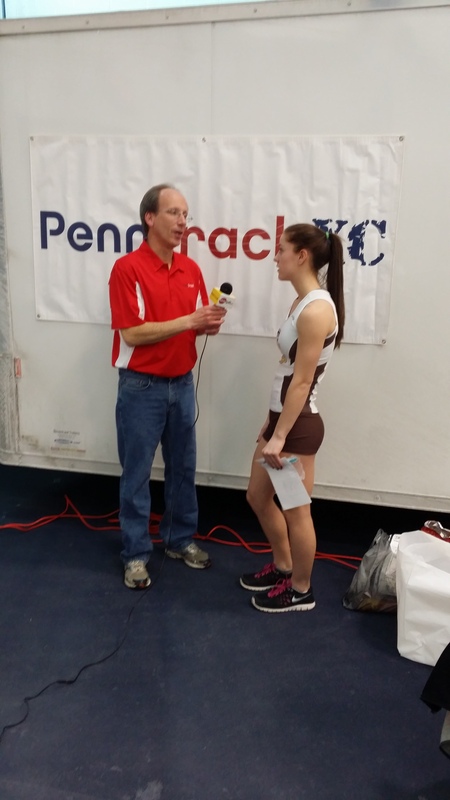 Courtney being interviewed by Phil Grove for PennTrack. As great as it was to celebrate the victory with Courtney, one of the best things about it was to see her being congratulated by so many different people – people who were genuinely happy for her. And that includes Bridget, who got 2nd place and was the first to congratulate Court on the win. I’ve had the chance to work with Bridget, and I’ve gotten to know her through this process, so I can attest to what kind of a young lady she is, but I can assure you that it’s a great thing to see this happen. So many people in other events and other sports wouldn’t dream of acting as classy as Bridget did and does. Sometimes, as coaches, we think that we’re the ones imparting the wisdom. It’s not that hard to figure out that it’s the other way around most of the time and we are truly lucky to be along for the ride. This entry was posted in just random and tagged Bridget Guy, Cassidy Shepherd, Courtney McQuaide, Craig Stamford, Greensburg Salem, Hempfield Area, Jackie Rodgers, Joe Sanford, Kasey Kemp, Kelsey Plecenik, Larissa Debich, Lexi Masterson, Matt Fox, Melissa White, pole vault, Rob Theissen, Steve Cochran. Bookmark the permalink. Congrats to all involved. It is wonderful to not only see Courtney win and represent her self, school and community well, but also for those who were a part of her getting there. We all know that we have far more people than ourselves to credit for our success. It is also great to see Westmoreland County representing so well.